The epic story, originated in a 30-year-old novel, can now be seen on Broadway and at the movies. But which spectacle comes out on top? THE LIGHTS COME UP. The audience claps. Couples take turns brain- and nit-picking before returning home to relieve the babysitter. In the end, the experiences of film and theater aren’t all that different, and crowd-pleasers have a way of stirring up cheers no matter the medium. But how often is it that such a work is available in two arenas at once? War Horse, which began as a novel in 1982 before being adapted for the London stage in 2007, can be seen, right now, both on Broadway and in movie theaters, as the stateside theatrical production continues alongside the re- lease of Steven Spielberg’s big-screen translation. The re- cipient of five 2011 Tony Awards, including Best Play, Broadway’s War Horse sets the bar high, boasting strong prestige and near-unanimous viewer approval. Spielberg’s take, an old-school, broad-canvas picture that deliberately nods to the days of John Ford and Technicolor, pulls out all the stops and formal guns so as to match the play’s majesty. But does it succeed? Which incarnation of Michael Morpur- go’s book is more deserving of your claps and car-ride con- versations? Really, it comes down to what moves you, and what sort of implementation of craft leaves your mouth agape in wonder. Directed, in its current version, by Tony winners Marianne Elliot and Tom Morris, with scenic, lighting, and sound design by Tony winners Rae Smith, Paule Constable, and Christopher Shutt, respectively, the play most certainly has innovation on its side, parlaying a classic yet dusty story into a stunning showcase of remarkable stage tech- niques. As many already know, the horses in the production, like Joey, the central stallion who gallops his way through World War I after being taken by the military from best pal Albert, are man-operated puppets, contraptions of wood and leather conceived by Adrian Kohler and Basil Jones’s Handspring Puppet Company. Though the puppets have a very homespun, nuts-and-bolts look, and clearly take at least some inspiration from the anthropomorphic costumes in Julie Taymor’s The Lion King, they appear utterly inven- tive on stage, wielded by patient perfectionists who expertly instill soul with tail flicks, ear flutters, and subtle, believ- able equine sounds. They are part of an overall design that’s extraordinary for its blend of traditionalistic elements and chic, modern minimalism. Without ever appearing on-the-nose or literal as some- thing ripped from the pages of history, the stage’s backdrop is a giant strip of torn paper, a rough-edged projection screen that intermittently bears charcoal-etched landscapes, the date and setting, and iconic animations (Eadweard Muy- bridge’s Horse in Motion is shrewdly evoked). The stage it- self is often dressed with the scarcest of props and other mechanical animals, like a wheel-mounted duck that makes for an excellent running gag. The biggest wow factor lies in the expert depiction of battle and spectacle, a streamlined, brilliant barrage of hand-tooled action that elicits childlike amazement. To simulate a horse-mounted soldier getting shot, stage hands rush in through the crowd with an over- sized, screw-like bullet on a stick, which strikes the actor before he’s carried off in simulated slow motion. At a mo- ment as arresting as anything you’re likely to see on stage, a tank emerges from behind the curtain line, its menacing arts-and-crafts look suggesting the world’s most formidable papier-mâché project. 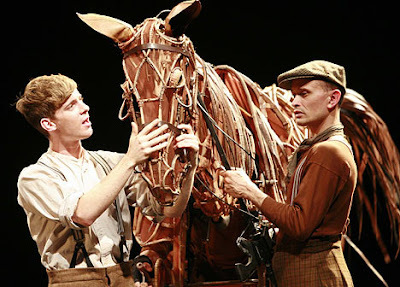 The most memorable and striking thing about the War Horse play is that it has the ardent au- dacity to get in a viewer’s space, its deftly calibrated ele- ments surging out to the edge of its circular stage, and beyond. Figures rush through at scene breaks and criss-cross the floor with barbed wire. Actors line the aisles with pen- nant strings. This is a show whose viewer involvement hardly stops at the emotional. And then there is the cinematic interpretation, which is currently lighting up screens across the globe and trotting along the Oscar campaign trail. Spielberg lovers will delight in what the maestro has to offer here, reveling in all the aes- thetic trademarks that have come to define His Blockbuster- ness. Duly accounted for is the heavenly backlighting, as well as that unmistakable Spielberg gaze―a character’s face in glorious close-up as he marvels at something breath- taking (in this case, naturally, it’s a certain astonishing steed). Such an expression, as always, is what Spielberg hopes will be a reflection of his viewers, an in-text dupli- cate of magnificent awe. There are times when the War Horse film absolutely warrants this, as its epic action set pieces are easily last year’s finest. Janusz Kamiński, the cinematographer who’s shot every Spielberg film since Schindler’s List, offers up one magical vista after another, most notably the angelic emergence of soldiers from a wheat field (soldiers who, ironically, are about to unleash hell), and Joey’s climactic dash across ravaged battlefields, a sight that ranks among the more rousing to emerge from recent popular films. Spielberg opens up the story to a whole new world of wide-angle grandeur, and his technical muscle-flexing pro- vides a certain sweep the stage show inherently can’t. But whereas the play partners novelty with convention, the film is wholeheartedly old-fashioned, often cripplingly so. You’d be hard-pressed to find a current film more worthy of the- atrical presentation, but you’d be harder-pressed to find one more doggedly unoriginal, trumping youthful wonderment with a regressive disregard of roughly 60 years of film nar- rative. 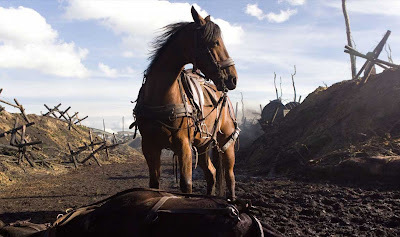 The heightened awareness of horse slaughter in ar- chaic warfare remains intact, but Spielberg otherwise pilots a redundant story to a saccharine finale, which he paints in all the fiery, preposterous hues of Scarlett O’Hara’s day- dreams. There’s no question that it was the director’s intent to concoct a throwback effort, a family film untarnished by contemporary grit and cynicism. But that can’t help his movie’s lack of satisfaction, nor can the masterful handi- work of collaborators like Kamiński (also on board and on point are editor Michael Kahn and composer John Williams, both Spielberg regulars). 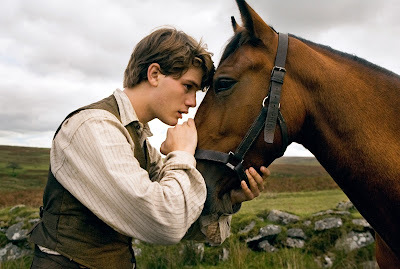 The overwhelming adherence to picturesque tradition starts to suffocate the heart of the tale, and Spielberg’s devotion to faces in particular hampers the poignancy of the boy-and-his-pet bond (newcomer Jeremy Irvine is far more handsome than he is diligent or affecting). All the gleaming, formal sap in the world can’t outshine lat- ter-day realness. There is something to be said for Spielberg’s commit- ment to his visions, and no one can call his War Horse a poorly-made film. But at the end of the day, when the ap- plause has settled and the chatter has stopped and the babysitter has gone home, one simple surprise remains: a puppet, transparently and primitively manipulated by actors, has the power to draw out more gasps, cheers and genuine sobs than an actual, wondrous animal, photographed in flesh and blood. *This article was previously published in the February 2012 issue of ICON Magazine. It has been republished with permission.